Liberty Christian School is located on 35 acres in Owings Mills, Maryland, a suburban area on the border of Baltimore and Carroll counties. Students commute from several local counties as well as Baltimore City. 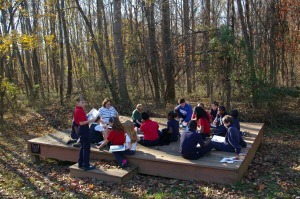 The school makes good use of its wooded property. Next to the soccer field, parents built a large, modern playground for the lower school students. A fenced-in water garden, a gift from our parent-teacher organization, contains ponds, a stream and native plant and animal species and provides an experiential way to supplement our science classes. In addition, there is an outdoor amphitheater with a stage area and benches, as well as hiking trails and a clearing used for various school activities.grade, a separate wing for our middle school grades, a lower level kindergarten suite, a media center, a gymnasium and locker rooms, a computer lab, a science lab, as well as art, music, Spanish and tutoring classrooms. In addition, the school includes a fully-operating kitchen serving hot meals every school day, administrative offices for school staff, a teachers’ lounge and a nurse’s suite. The school is also blessed to have the use of the church building and sanctuary, where larger school gatherings such as chapels and assemblies are held.